all on Turk 2 starting next week 4/24/19. We are pleased to share that the Travel Tryout schedule for the 2019-20 Travel season is now available and registration for tryouts is officially open. The Tryout fee is $10.00. 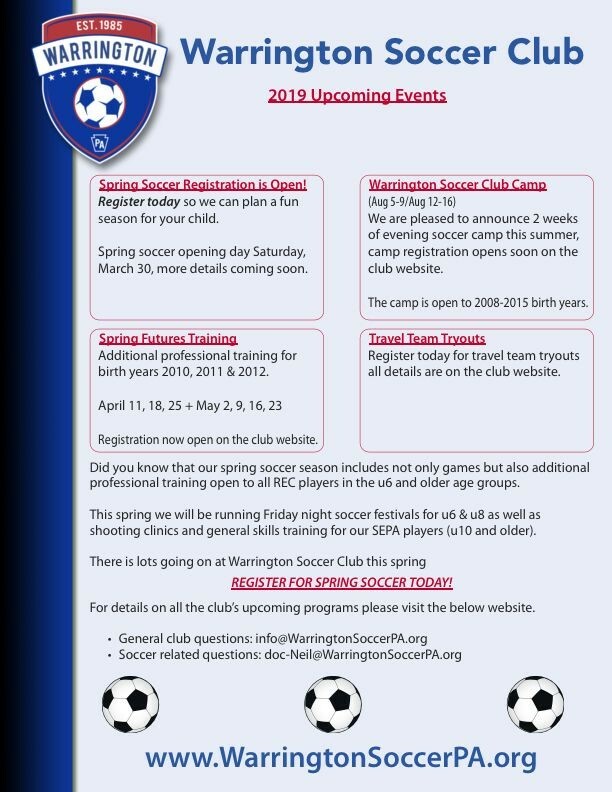 The Warrington Soccer Travel Program is open to all players u9 through u19. For the 2019-2020 season players born between 2001 - 2011 are eligible to play in the club's travel program. The Club offers a full range of programs that can meet the needs of players at any level of play - from beginner to premier. For full tryout details read the Travel Tryout Overview. All players in the 2009-2010 birth years (U10) will now play as part of the South Eastern PA Recreational Soccer League (SEPA). The league is designed for recreational soccer players from local townships in Bucks, Montgomery and Philadelphia Counties. Players may travel to neighboring clubs for their games. The spring season games begin the weekend of April 5th - 7th. SE PA Rec League Games may be on either Friday, Saturday, or Sunday. U5 through U8 games will begin on Sunday, April 7th, 2019. During the spring season, there are games only, no practices. MANDATORY VOLUNTEER FEE:Warrington Soccer Club relies on the support of its volunteers. There will be a mandatory volunteer fee of $75 (per family) added to your cart during registration. If you wish to earn the volunteer fee back, please register as a volunteer by selecting a volunteer position on the screen when prompted. When registering a 2nd or additional children, the volunteer fee of $75 for those children will be deducted on your check out screen - the fee is per family. If you paid the Volunteer fee in the Fall 2018, the fee will be deducted on your check out screen - the fee is per family. To sign up for the Spring Intramural season, please visit the Registration Page.